All ground covers will be perfectly chose for your hardy planting zone. This package will save you money. If you add up all the plants you want this one is far best. This package has a good variety that makes them a good package. This is a good variety for either a small or large area! Ground Cover Garden Collection soil erosion is sometimes a necessary evil of landscaping. 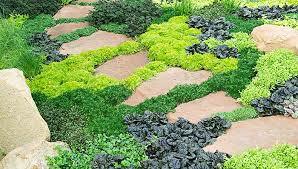 However using the appropriate ground covers for the situation, can stop or at least keep soil erosion to a minimum. There are, however, ground covers that can both climb rocky slopes to halt soil erosion as well as cover areas on the ground that cannot seem even to grow grass. Vinca Minor is a fast-spreading plant. It is one of the more popular slope covers used. It is a fuss-free plant that loves to build anywhere and will grow in poor soil, on rocks, in the shade or full sun. It does not matter to this plant. It will even increase where grass will not. It makes for a pretty ground cover under shrubs and trees. The vinca minor has dark green leaves and blue flowers in the spring. It will grow to be about 4-5 inches. This plant needs no special care. The English ivy is another favorite plant when it comes to slope covers. It will spread horizontally and reach a height of about 8 inches. It is an evergreen that does flower, but because the herb is green, it is hardly noticed. The ivy is also helpful at weed control and also is suitable for planting in shady areas under trees and shrubs. The vine is fast growing. It does require trimming to keep it under control. The partridgeberry plant is a slow-growing plant that is not very aggressive. It only grows to about 2 inches high. It is a very showy plant with white flowers in the spring and red berries that last through the winter. Along with covering slopes, it is a good cover for bare, shady spots. The partridgeberry prefers moist drained soil. However, it is very tolerant of the cold, and it will keep its lovely color even in the extreme winter conditions.